Vanessa Alvarado, Daisy Cates, PAZ, Margarita Paz-Pedro, Lia Lynn Rosen, Cassandra Reid and Mark Woody. 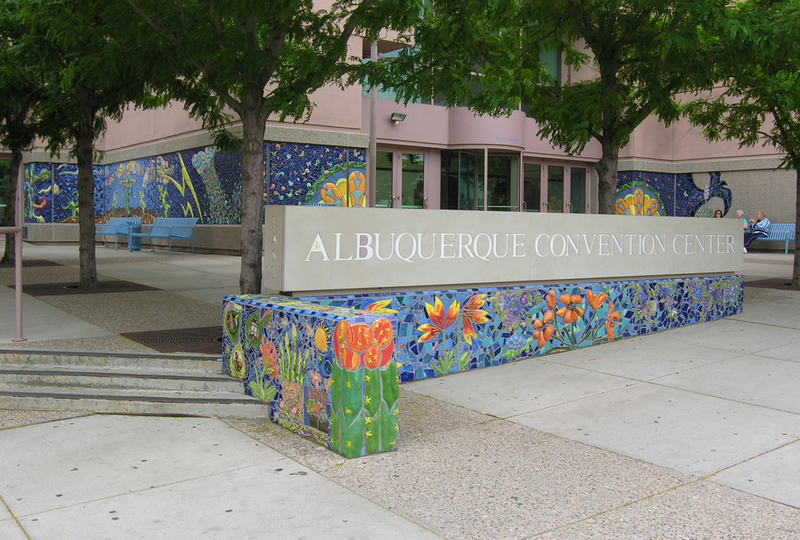 This multi-colored mosaic tiled wall surrounds Albuquerque's convention center with imagery of southwestern symbols, cultures and traditions. Cassandra Reid has worked in public art for twenty years. She specializes in creating mosaics from handmade tiles and has completed more than forty mosaic murals and sculptures at sites around New Mexico. Margarita Paz-Pedro has had a relationship with clay since 1999. She received her BFA with an emphasis in Ceramics in 2003 from the University of Colorado-Boulder followed by an MA in Art Education in 2008 from the University of New Mexico. During that time she began her study in the Arita Porcelain class and had the opportunity to do an apprenticeship with artist Fance Frank in Paris, France (fall 2007). Since 2009, she has worked as a lead artist with the Mayor's Art Institute, currently of ALMA, creating large-scale public art mosaic murals across New Mexico. In 2015, she helped start a non-profit called ALMA (Apprenticeships for Leaders in the Mosaic Arts). She is also a full time Art teacher at La Academia De Esperanza Charter High School, which bridges her passion for working with community and youth in the arts.